Planning and booking your annual holiday can be one of the biggest financial decisions you make each year, with this in mind it is essential that you research your planned trip thoroughly. Below is our guide of 7 essential steps to ensure that you receive the holiday that you expect. Our website contains our most up-to-date offers and pricing information. Please click the holiday type, destination, guided or species to suit you. Then just browse through the search results listed on the left hand side. When you review your list of search results, the price shown on this page is the lowest price of the holiday. By selecting which holiday you are interested in you will see all available dates with prices assigned to each of them. Remember the price you see is for everything in the “What’s Included” list. If you require additional information you can use either the “Request a brochure” or “Make an enquiry” facility. What if I don’t live in the UK? Can I still make holiday enquiries and book a holiday with you? Yes, as one of the leading specialist tour operators we have a large existing database of customers from around the world and we are experienced in dealing with overseas customers. Just use either the “Request a brochure” or “Make an enquiry” facility and we will be more than happy to respond to you. Bookings can then be made via either e-mail or the telephone. Please make sure that before making any booking you have read our Terms & Conditions either on our website or on the inside back cover of our brochure. Once booked, you will receive your provisional booking paperwork confirming your itinerary, what is included and what is excluded, along with a deposit request and booking form. You will need to return both a completed signed booking form along with your deposit, to our head office in Norwich. We will ask you to correctly spell the first and last name of each travelling member. Some flights will need to be ticketed at the time of booking and due to airline regulations no name changes can be made once a ticket has been issued. Please note delays in returning the booking form may result in an increase in flight cost as NO flights can be held until we have each member of the bookings correct details. Travelling more than 12 months in advance: Only a £200 to £500 deposit is required and then the remaining deposit to the value of 50% 12 months before departure. Note: For larger value bookings a higher initial deposit maybe required. On receipt of both a booking form and deposit, all confirmation paper work and if applicable a ATOL certificate will be sent to the lead booker. This will then represent a legal contract between all parties. In your confirmation paper work will be your pre trip information. 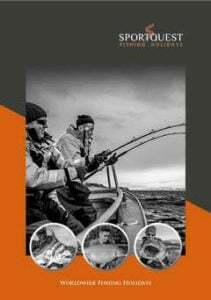 This will detail what to take and not to take, it will also contain a detailed list of any fishing tackle (if required) to ensure that you maximise the full opportunities from your travel. As a rule all flight tickets, either paper or e-tickets along with any other additional travel vouchers and your departure / arrival instructions are sent to the lead booker 10 days prior to departure. Each travelling member will also receive our complementary travel wallet, luggage labels and a free gift. One week before you depart your dedicated travel consultant will telephone the lead booker and all other members of the booking to ensure that you have received all your final paper work and that everything is in order. At this point they can then answer any last minute questions before wishing you all a fantastic holiday. Once you have returned we would love to hear any feedback from your holiday. It is important to us as a company to constantly manage and review all our destinations and alter any elements that do not meet everyone’s expectations. Each member who has travelled will have awaiting in their e-mail inbox a welcome home message, which contains a link to our very own live feedback form. We also post everyone a customer feedback form with a pre-paid return envelope as this customer feedback process is your opportunity to rate the services you have received from Sportquest Holidays along with reviewing the services of the destination travelled. We believe our customer feedbacks to be of the utmost importance, for all reviews are published against each destination allowing both us and future customers to read REAL customers experiences. We also believe in the personal touch so the lead booker and each member of the booking will receive a telephone call approximately one week after you return to review your holiday experience and also see if you have any pictures that you would like to share. You can use the USB memory stick that we posted with the customer feedback forms to share your pictures. You never know you could appear in either our regular blogs or the next full colour brochure.